Replacing a pipeline can sound like a big job. Traditional pipeline replacement methods have earned a reputation for being expensive, time-consuming, and inconvenient. And for good reason. Old methods of replacing pipes involved digging large trenches in homeowners’ backyards, breaking through their flooring, and cutting into walls to remove the old and damaged lines. Fortunately, with trenchless methods pipeline replacement can be accomplished far more easily and without disrupting the property around the pipe. Using trenchless technology, small sections or large spans of pipes can be completely replaced using just a small access hole. This means that home and business owners are able to continue on with their days, and won’t need to reconstruct their buildings or their landscape. But how is a full pipeline replacement accomplished without a trench? The preferred trenchless method for replacing a very damaged or corroded pipe is called pipe bursting. Pipe bursting machines are equipped with specialized nozzles designed to break the pipe apart as they move through it. The pieces of the pipe are then pushed into the ground surrounding it, removing the need for cleanup and clearing the way for the new pipe. The new pipe is attached to the back of the pipe bursting nozzle, so the freshly created space is immediately filled with a new, working line. All of this takes place from above ground, and the pipe needing replacement is accessed through a small access hole so the disturbance to the surrounding property is minimal. The pipe bursting head is fed down into the line through these access points, and guided through from above ensuring accuracy. Pipeline replacement becomes necessary when existing pipes are damaged beyond the possibility of repair. To determine this, trenchless pipeline technicians use access holes to feed a small camera into the line. The camera footage is monitored on a screen above-ground, meaning our trained technicians are able to get an in-depth and detailed look at the state of the pipes before any major work has begun. If the camera inspection finds there are some small cracks, manageable holes, or minimal corrosion it is likely that a full replacement will not be necessary. Relatively healthy pipes with a few issues can usually be fixed using CIPP repair methods, and will be able to get back to functioning properly without further concern. Pipes that have major holes, widespread cracking, large amounts of corrosion, or that are beginning to deteriorate will not hold a new liner well and will therefore need to be replaced. Camera inspections are by far the best way to tell the extent of the damage in a line, and are wise to conduct before beginning any project. How much does pipe bursting equipment cost? There are many different types of pipe bursting equipment available. From replacement parts to entire units, the professionals at TRIC Tools have you covered. But what can you expect to pay for these parts? Available in a variety of sizes, bursting heads are the specialized attachments that feed through the pipe that needs replacing breaking it up and distributing it into the soil along the way. Of course, new bursting heads tend to cost a bit more – but often that expense is justified by the increased life expectancy of the product. When buying new, pay special attention to how the head will join to your line or cable. Heads that can be attached directly to the open end of a pipe will differ in price from those that need to be fused onto the unit. Moreover, the material the head is made of will also impact the cost, as will its size and capacity. The higher the numbers are for the above features, the heavier duty the machine tends to be. These capacities, along with the make, model, and year of the unit will give you a good idea of how much you can expect to pay. All of these factors taken together should give you a pretty solid idea of what price range you can expect your hydraulic pump to fall into. Who can benefit from purchasing pipe bursting equipment? Regardless of where you work in the pipeline repair industry, pipe bursting equipment is a great investment for your business and your customers. Whether you are a contractor, a trenchless pipe repair company, or a pipeline repair company looking to expand the services you can offer your clients, pipe bursting equipment will be a great investment in your financial future. You know the basics of trenchless technology. Pipelines are inspected with a camera, lines are cleaned out with hydro jetting - or a high-powered multi-directional nozzle that shoots clean water, and repairs are accomplished by strategically applying epoxy liners to the inside of existing pipes. But what if you come across a job where the pipeline is too corroded to be repaired? Or where there are severe breaks due to earthquakes or other major events? Your customers will need their lines replaced, and not being able to offer them a trenchless option for their plumbing needs could hurt your business in the long-run. Where can you buy pipe bursting equipment? We know the basics of cost, and one of the main things that impacts where the equipment you purchase will fall in that range is what type of seller you purchase from. There are a few options, all with their benefits and drawbacks, that you can weigh as you consider where to purchase the equipment your business needs. 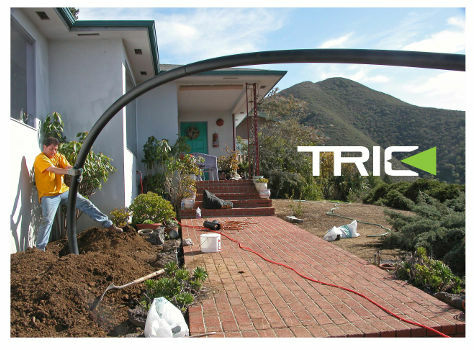 Reputable online retailers like TRIC Tools are a great resource for buying new equipment. The large selection and range of inventory means that you can find the pieces you need when you need them, without the stress of having to hunt through stores or comb through a variety of sellers. On top of that, online retailers who specialize in pipeline equipment employ knowledgeable staff that can answer your questions and help guide you toward the purchases that will best meet your needs. If you’re looking for used equipment, you may start by looking to online sellers like those on Craigslist or private sellers you locate through forums or industry sites. While these prices will be lessened because the equipment is not new, you may not be getting a bargain in the end. Be sure to do a thorough evaluation of anything you plan to purchase from an independent seller. These sales are usually not regulated by a larger company, meaning there is little accountability if something goes wrong with your recent purchase. Moreover, if you are looking for something specific it may take a bit of luck to locate it through these channels. Plumbing supply stores can be great sources of information, and often carry a wide selection of equipment. This broad inventory makes it easy to find what you need, and you can get the in-person experience of speaking with a pipeline professional before you make your purchase. That said, it is more expensive to keep a storefront open than to run an online store, so you may find the prices at plumbing supply stores to be inflated above what you might be able to buy online. A good option for those looking to purchase used equipment in-person is contacting your local plumbing companies. While it may be a bit harder to find exactly what you’re looking for, many plumbing companies will sell their old pipe bursting equipment - often at a discounted rate. Be aware, though, that equipment from these companies was likely heavily used. It’s a good idea to examine the equipment yourself before you buy it to ensure there is no major damage that would keep it from being useful to you and your business. Pipe bursting can be used as a method to replace almost any kind of pipe in multiple locations. Regardless of why your client’s pipes might need to be replaced, it is likely that pipe bursting will be a good choice to solve the issue - making the purchase of this equipment even more valuable. One of the most common reasons a pipeline may need to be replaced is if the pipes are failing. Extensive damage, age, corrosion, and decay all can make an existing pipe unsalvageable. All pipes, from water mains to sewers, are subject to wear and tear over time, meaning that eventually almost all pipes will be good candidates for replacement. Sometimes when a new structure is put in or an area experiences a spurt of growth, the existing pipe size is no longer up to the task of conducting water and waste away from a building. If pipes are too small to handle the task at hand, a multitude of issues can occur. Backup, pooling, and recurrent clogs are all potential signs that the existing pipelines are too narrow for their structures. Pipe bursting can remove the current pipes, widen the pipeline’s channel, and deposit a new, larger pipe in its place in one fell swoop. Very old buildings usually have very old pipes. The materials that were once commonplace, such as copper and iron, often no longer hold the appeal they once did. These metals are susceptible to corrosion, cracking, and environmental decay in ways that modern materials are not. Most newly constructed homes or buildings use PVC pipe, which is more durable and less likely to fail. When evaluating pipeline systems, out-of-date pipes or pipes made from materials that are particularly at-risk to damage are often considered red flags. Using pipe bursting, you can save your clients future headaches by removing their old pipes and replacing them with new ones that are made from hardier materials. While pipe bursting is often used to replace sewer pipes, it is still useful for many other types of pipelines. Gas pipes and water lines can also be replaced using this trenchless method, meaning your new pipe bursting equipment can be put to use throughout your plumbing practice. If you’re looking to buy pipe bursting equipment, you’ve come to the right place. TRIC Tools stocks a wide range of pipe bursting products, all of which are verified for quality. Head over to our online store to browse our inventory now, or call one of our pipeline experts to get more information and to have any questions you might have answered. Our company deals exclusively in this type of equipment, so you can be sure that the products we stock are of high quality. We have the experience to know which heads are right for which project, how powerful your hydraulic pumps need to be, and which brands and models hold up best over time. Moreover, our online catalog includes detailed pictures and descriptions so you can be sure that the piece you are looking at is the one you need and make your purchases with confidence.